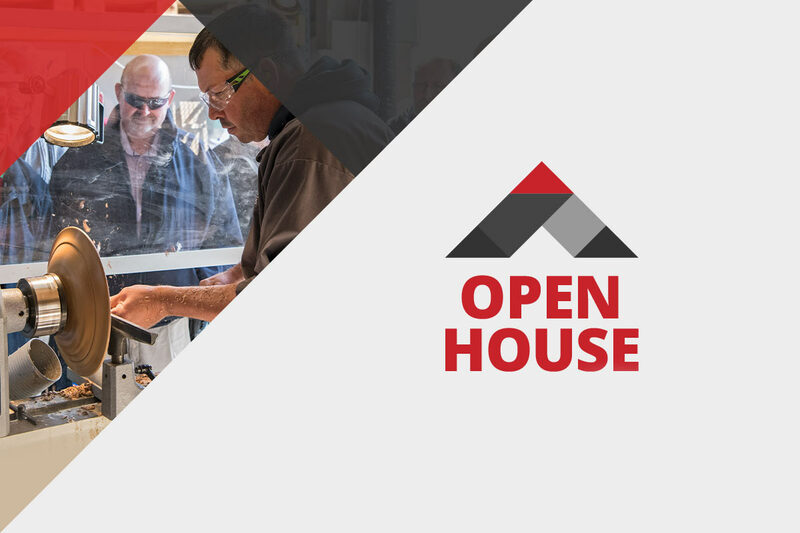 It was a cool and blustery autumnal day on Friday 21st September when Axminster Tools & Machinery opened its doors to the public, welcoming over 200 visitors to HQ on Weycroft Avenue in Axminster. Visitors were able to experience around 40 demonstrations and get hands-on with many tools and machines. Among the demonstrators were well known faces such as Robert Ingham – distinguished maker of collectable boxes and unique furniture pieces; Peter Parfitt – inventor of the UJK Parf Guide System and Parf Super Dog; Matt Estlea – talented young woodworker and YouTube star, and Colwin Way – international woodturner. 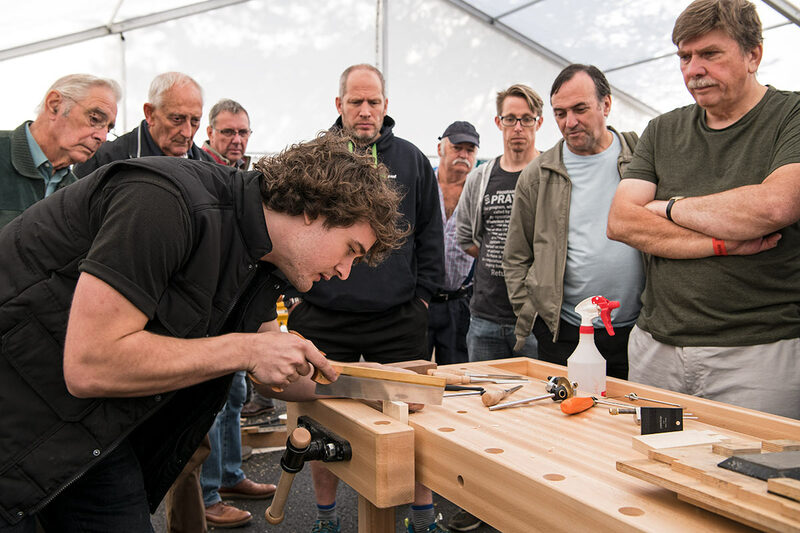 Matt Estlea demonstrating how to create dovetail joints by hand. Peter Parfitt (left), with Talhah Rasool from our High Wycombe store, showing how to transform the accuracy of your work with the Parf Guide System. Robert Ingham discussing the finer points of box and furniture making. HQ folk and many staff from all of Axminster’s eight stores took part, showing their expertise and woodworking skills. Some of the more quirky demonstrations from Axminster staff included Joe Berry with his cricket bat shaping. Also, Wayne Asher ran the ‘Hard Point Challenge’. The challenge was to cut through a piece of 2”x4” in the quickest time; the prize was a set of three Axcaliber saws. Plus, product development director Ian Styles gave a preview of the ‘Ultimate Edge’ – a new sharpening product launching soon. In addition, Wentworth Timber, who supply all the Axminster stores, were present as were UKMSA (Men’s Sheds Association) displaying the kinds of things they make (local Axminster stores work closely with local ‘shedders’). A preview of the ‘Ultimate Edge’ from Ian! A selection of new Axminster Craft machines on display. Andre May from our High Wycombe store demonstrating Microplane rasps. Approximately 160 visitors signed up for the guided tour around the site. 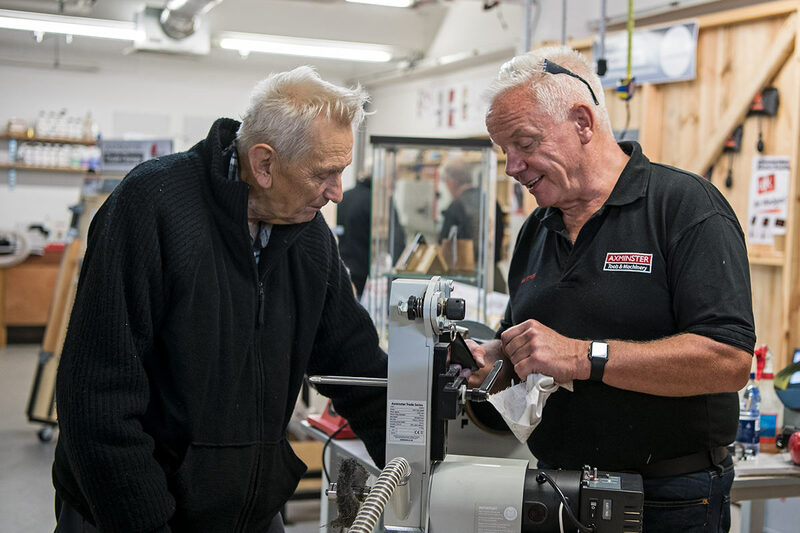 An Axminster director led each tour, taking visitors to the engineering facility where woodturning chucks and accessories, bandsaw blades and many products in the UJK Technology range are manufactured. Other points of interest on the tour route were the Skill Centre and warehouse which was fully operational on the day. To keep warm, visitors were able to take advantage of the free tea, coffee and biscuits on offer. What’s more, to add to the feeling of warmth, Axminster offered a 10% discount throughout the day.